Spending an Afternoon in The Forum Carlsbad is Easy to Do! It’s almost the weekend, and we’ll bet that you’ve got a ton of errands to run. 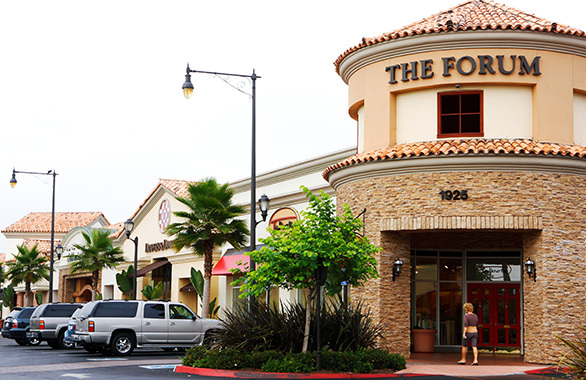 With The Forum Carlsbad being home to dozens of shops and services, it’s a convenient location to get several things crossed off your list at once. With proper planning, you can be in and out in an hour or two and still have time for a little fun! First, stop by Paper Source and pick up a card for your co-worker as a way to say “Thank You!” for all her extra help this month. You’re desperately in need of some new jeans, so you’ll have to try on a few pairs at a few different stores to get the best fit. Might as well try on some tops while you’re at it, right? Once your new outfit(s) is complete, it’s time to purchase a new bottle of your favorite scent at UTLA Beauty and then return those bed sheets you decided were the wrong color (darn!) at Bed Bath & Beyond. Renew your yoga membership at the Ashtanga Yoga Center, then go freshen up your toes with a pedicure or take a few moments to relax with a well-deserved massage. You’ve been busy today! Now that you’ve worked up an appetite, it’s time to meet up with your special someone for an early dinner at Casa de Bandini. With a satisfying selection of appetizers and entrées, we’re sure to have the right flavors to fit your mood. Enjoy your favorite dish with our famous birdbath margarita as you relish in the San Diego sun on our beautiful outdoor patio. Finish up with that fried ice cream you’ve been craving all week, and pat yourself on the back for a day well spent! It’s been a fun and productive day at The Forum Carlsbad. With so many things to do, Casa de Bandini is proud to call Carlsbad’s favorite shopping mall home. We hope to see you again soon! 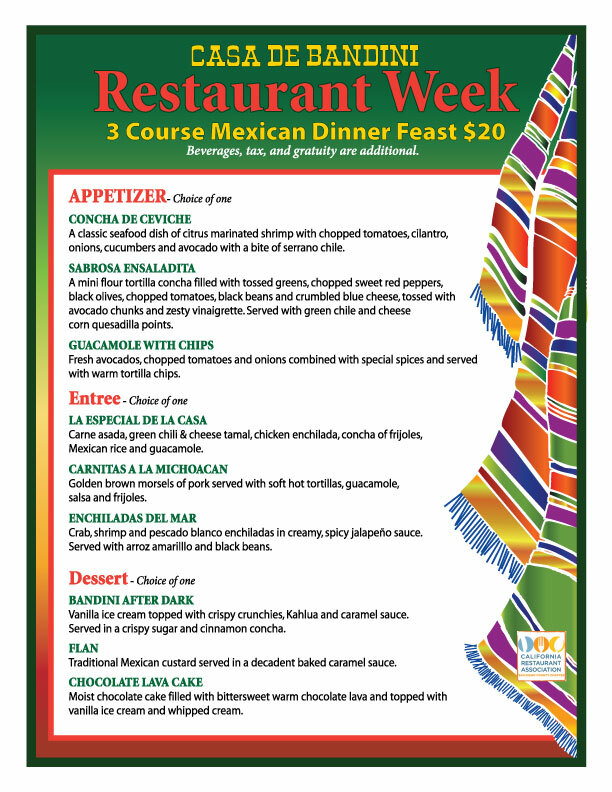 Casa de Bandini participating in San Diego Restaurant Week starting this Sunday! 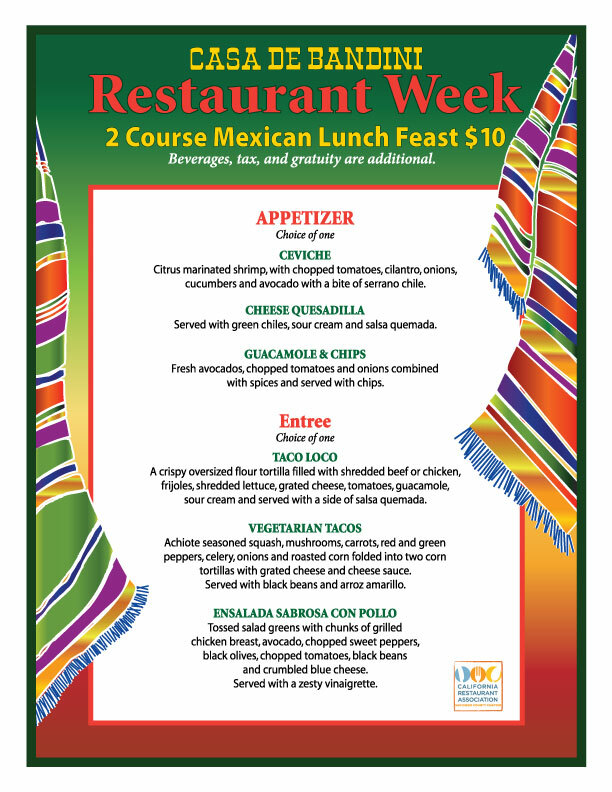 Casa de Bandini is participating in San Diego Restaurant Week which starts this Sunday and runs through this Friday, January 15 – 20. We’ll be offering our usual superb meals at special prices all week. 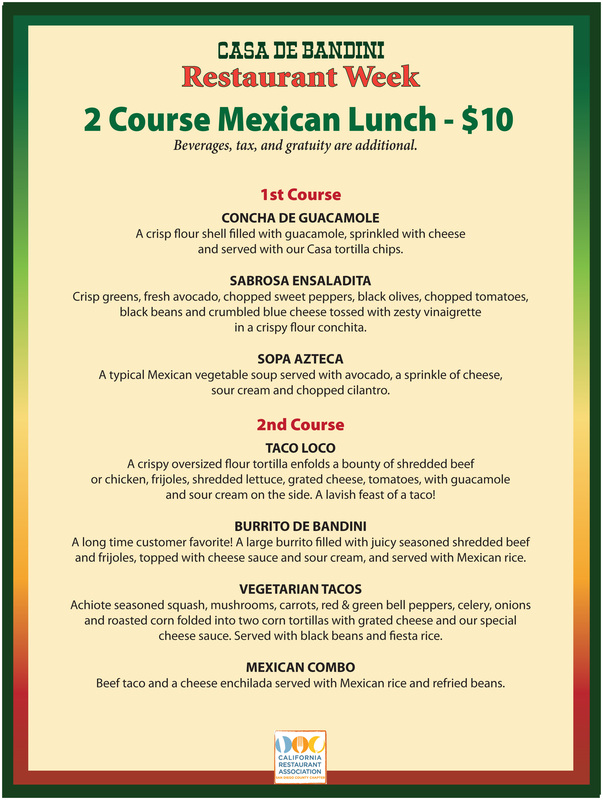 Here are our lunch and dinner menus. Come see us. We’re open Mon – Thu 11:00 AM – 9:30 PM, Fri – Sat 11:00 AM – 10:00 PM and Sundays 10:00 AM – 9:30 PM. Happy Hour is Mon-Fri from 4 PM until 7 PM in our Cantina. We look forward to seeing you! 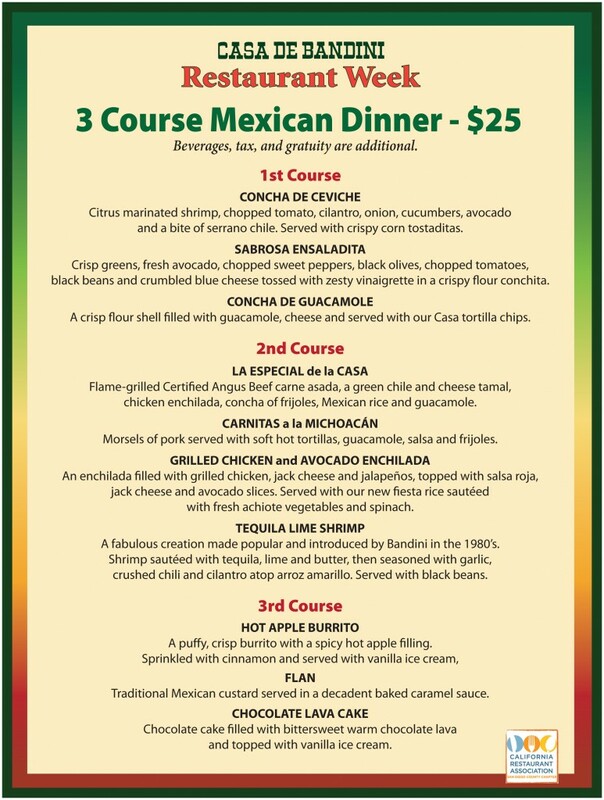 Come enjoy a delicious meal with one of our award winning margaritas!